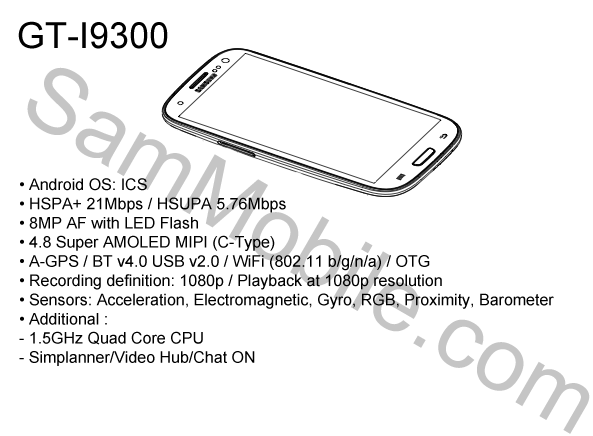 As the days grow closer to the highly anticipated release of the Samsung Galaxy S3 we are seeing a lot of leaked images and renders of the device. Here we have yet another supposedly leaked image in what appears to be a scan from the service manual for the device, along with a list of specs, which comes from an unofficial Samsung blog, SamMobile. If you have been following all the leaks you will note that this one is an exact match for the shape teased by Samsung Denmark on Facebook last week. This could be the real deal and the actual, final design of Samsung’s new flagship phone.